Home » Facts » Health » Knowledge » Science » Bats Are Main Host for Ebola Virus but Theoretically Human is Responsible for Spreading the Disease in the First Place. Find Out Why? Bats Are Main Host for Ebola Virus but Theoretically Human is Responsible for Spreading the Disease in the First Place. Find Out Why? Did humans bring the latest outbreak Ebola on ourselves? Quite possibly, YES! To understand how and why, you first must understand how Ebola spread to humans in the first place. Fruit bats are believed to be the animal reservoir for the virus. Since bats gather in humongous colonies, it makes them perfect for incubating Ebola. Specially, bats often do not show symptoms of the disease. The more the virus spreads from bat-to-bat the more likely it will mutate and become even deadly for human. How Will You Get Infected with Ebola? Now, you can get Ebola by coming in contact with the blood, saliva, feces or urine of an infected bat. We can also get it when preparing the bat for food or when eating it raw. Hey, wait... What eating bats? Errr... A bit of exotic food for everyone. 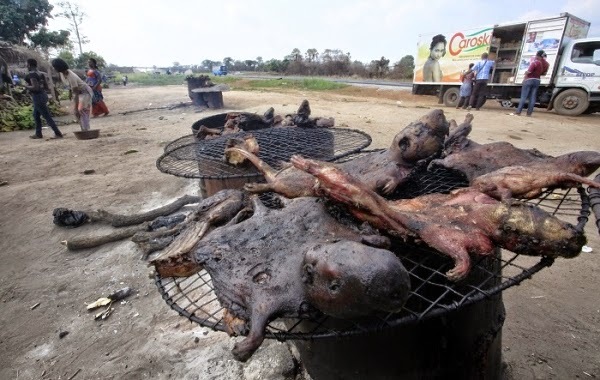 Yeah, as a matter fact, smoke-grilled bat meat and bat soup are commonly eaten in West Africa. In the recent outbreak the nation of Guinea has actually banned the consumption of bats altogether. However, that still doesn't prevent people from coming into contact with bats. This latest Ebola outbreak―the largest in history―is thought to have begun in Mongala, a small logging village in Guinea. When a 2-year-old boy came into contact with the fruit bat. Now, back to the question at hand, how could this outbreak be our fault? With Liberia selling logging rights to over 50% of its forest and Guinea's 80% decrease in its rain forests. West Africa is rapidly becoming deforested. These forests were homes to the fruit bats. So, without them... The fruit bats are forced to have more contact with humans occupying the deforested area. Basically, if Africa's forest were being harvested with conservation techniques and wildlife in mind. We could have possibly prevented Ebola from coming into contact with humans. But at the rate we're going now, soon there won't even be a habitat to be reserved. Thank you for reading Bats Are Main Host for Ebola Virus but Theoretically Human is Responsible for Spreading the Disease in the First Place. Find Out Why? posted on the website Kwentology if you want to redistribute this article please include the link as the source. Have some kuwento to share? Contact us!